Tag Archives: More Korean women go to college than men. 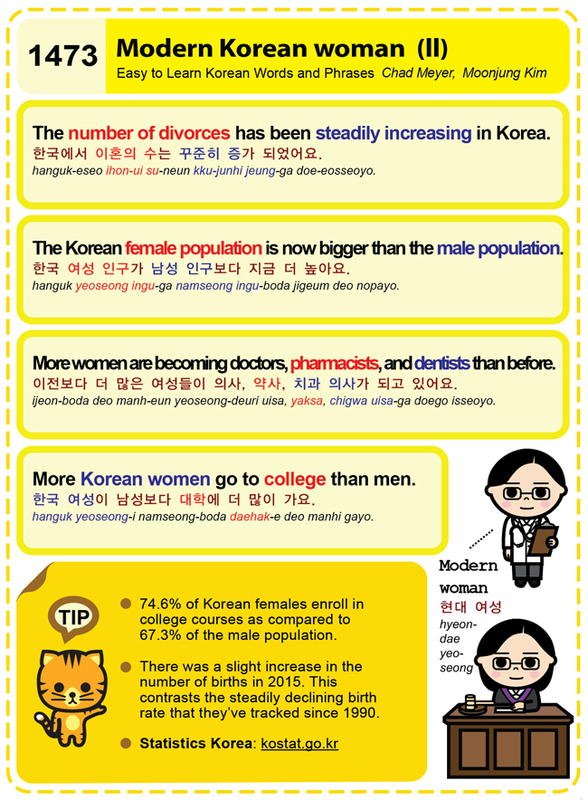 Easy to Learn Korean 1473 – The modern Korean woman (part two). Posted in Series	| Tagged and dentists than before., births, kostat.go.kr, modern Korean woman, modern woman, More Korean women go to college than men., More women are becoming doctors, pharmacists, Statistics Korea, The Korean female population is now higher than the male population., The number of divorces has been steadily increasing in Korea., women, 약사, 이전보다 더 많은 여성들이 의사, 치과 의사가 되고 있어요., 한국 여성 인구가 남성 인구보다 지금 더 높아요., 한국 여성이 남성보다 대학에 더 많이 가요., 한국에서 이혼의 수는 꾸준히 증가 되었어요.